For many centuries across the world, weathervanes had been used to predict weather patterns by tracking the direction of the winds. Today, although still fully functional, weathervanes are mostly used as decorative accents. Our newest full-sized Flying Pig Weathervane is made of powder-coated steel and has a gorgeous copper patina finish to perfectly complement any home, barn, cupola or shed. 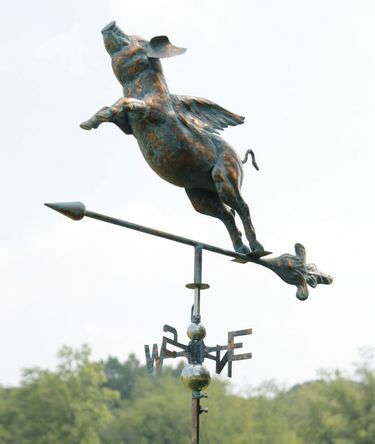 Handcrafted by skilled artisans, this weathervane is a work of art! Figure Dimensions: 32"W x 22"H.